You are probably wondering what the heck a Tastee sandwich is. Ask anyone who grew up in Lincoln, Nebraska. 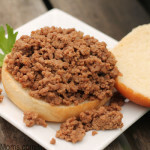 It is the best loose meat sandwich around! Tastee Inn & Out is a restaurant located just off of 48th & Holdrege. The place hasn’t changed much since opening their doors in 1948. The drive-thru window is on the passenger’s side of the car, orders are written down by hand and sent through a tube into the kitchen, and the trays of food come out on a conveyor belt from the kitchen. This one-of-a-kind restaurant created the legendary Tastee sandwich, loose hamburger served on a bun with mustard and a pickle. Aside from this sandwich, Tastee Inn & Out has wonderful onion chips and milkshakes for a “well-balanced” meal. I highly recommend trying Tastee Inn & Out the next time you are in Lincoln. Not sure when you will be in Lincoln? Well, you are in luck. I just happen to have the Tastee sandwich recipe and am nice enough to share it with you all. Looking for more tastee recipes (copycat Tastee Inn and Out recipes)? 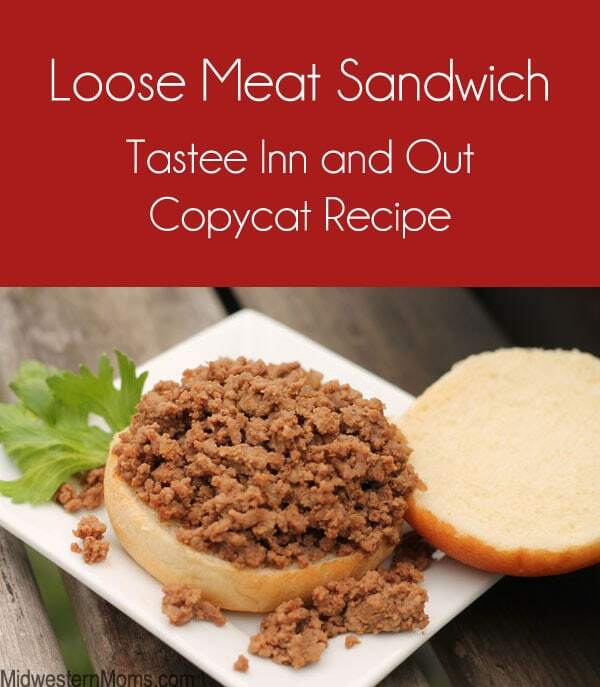 Tastee Inn and Out copycat loose meat sandwich. Combine in a 1-cup measuring cup: ketchup, prepared mustard, horseradish, Worcestershire sauce, salt, and pepper. Stir 1-cup mixture into beef. Add water to the beef mixture. Cook for 15 minutes, stirring constantly until beef is in fine pieces. Increase heat until boiling. Cook for 25 minutes, stirring often. Serve on hamburger buns will dill pickle chips and mustard. 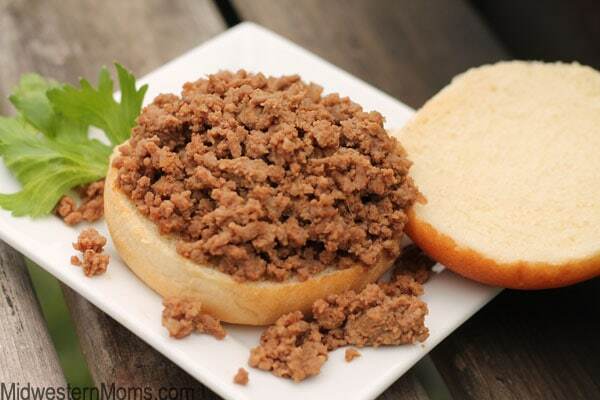 Put 2.5 lbs of lean ground beef in a kettle or deep skillet. DO NOT BROWN THE MEAT BEFORE ADDING THE OTHER INGREDIENTS! This recipe is from Julie, a good friend. If I am in a hurry and just have a small amount of hamburger I want to git rid of, I just put a small amount of water in the bottom of a small frypan and add hamburger (the less lean works good too….) and boil it until the hamburger is done, I use a potato masher to make the hamburger fine as it cooks. Then I just put a dash of worchestershire sauce, tsp of ground horseradish, squirt each of mustard and ketchup and salt and pepper. Boil it gently for a few minutes and remove with a slotted spoon and put on bun and add pickle. JUST like a tastee , experiment with the amounts of ingredients but it usually comes out fine. Thanks for the tips! I am constantly in a hurry so I will try this also! But you left out the most important ingredient for a REAL tastee and that’s Accent…just saying….I’ll try the short cut one tonight, see how they turn out. Thanks! Does anyone know the recipe for Tastee Inn’s onion chip dip? It was like cottage cheese in consistency, but so good! I am sorry but I don’t know that recipe. add milk & water, mixing until smooth. * shake onions in flour, then set aside to dry. Thank you for the Tastee Onion Chip and Chip dip recipe! I’ve wanted this for at least 50 years. I grew up near Sioux City, IA and the Tastee Inn & Out was our teenage go-to place for a late night snack or lunch with “Mom & Dad” on shopping day. It is so sad that Tastee Inn & Out closed at the end of 2013. The line was backed up onto 48th street when we were home at Christmas time. I’ve heard that Randy’s Bar and Grill accross the street on Holdredge is selling some of their items now. Thanks so much for sharing! I was so bummed when they closed Tastee Inn. I alway thought that maybe that restaurant rescue guy could help them out. But the owners have to ask for the help, not the customers. Tastee Inn would have been so…deserving of a rescue! Now I am holding my breath for Lee’s Chicken. Especially now that their chicken was kidnapped and destroyed. Watching my childhood fade away is so depressing. At least maybe now I can make it at home. Won’t be the same, but the memories are still sweet. Oh that sounds just crazy good! I didn’t have horseradish, so I subbed spicy brown mustard and it turned out good. You should use 85/15 hamburger or leaner since you won’t be draining the fat. I bet that tasted really good with the spicy brown mustard! Thanks for stopping by! Thank you. Really close to what I’m used to in the Midwest. Quicker than how I usually make them. Love it! A great recipe. The original tastees inn and out recipe calls for a teaspoon of accent. It acts as a meat tenderizer for the right texture. Lean beef is also preferably best since you won’t be draining the meat. I used “Silver Springs” cream style horseradish. I love tastees???? If you use 1 teaspoon of accent, do you still use the salt? I have never used Accent. If it is a type of salt, I would not add the additional salt. Wondering if any ‘seniors’ (as in ‘college youngsters in 1945’) know the name of a former Lincoln, Nebraska, restaurant (which served boiled hamburger) called _____?_____ Hut (not like Pizza Hut!?! Smile!) A 90+ friend is hoping to ‘recall’ the name – just for FUN! Thank U kindly!! No, it was the Yum Yum Hut. Yum Yum Hut around 33rd and O street. I was told about it by an older co-worker years ago. I love Tastee’s and I grew up in Lincoln. I am actually making them for our family on Thanksgiving weekend! Love it!